The committed step in the production of prostanoids is the metabolism of arachidonic acid to prostaglandin H2 (PGH2) by the enzyme prostaglandin H2 synthase, also referred to as cyclooxygenase (COX)1. Two COX enzymes have been identified2,3, termed COX-1 and COX-2. The COX-1 protein has been shown to be constitutively expressed in a wide variety of cells, whereas the expression of COX-2 is induced in response to pro-inflammatory stimuli4. It is now well established that non-steroidal anti-inflammatory drugs (NSAIDs), such as aspirin, ibuprofen, flurbiprofen and naproxen, block the production of prostaglandins by inhibiting the COX enzymes5. More recently, these traditional NSAIDs have been shown to be non-selective, inhibiting both COX-1 and COX-26. 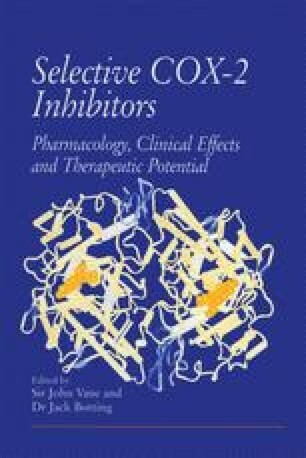 A hypothesis derived from these discoveries proposes that the undesirable side effects of classical COX inhibitors results from the inhibition of COX-1, whereas the therapeutic, anti-inflammatory effects result from the inhibition of COX-27.